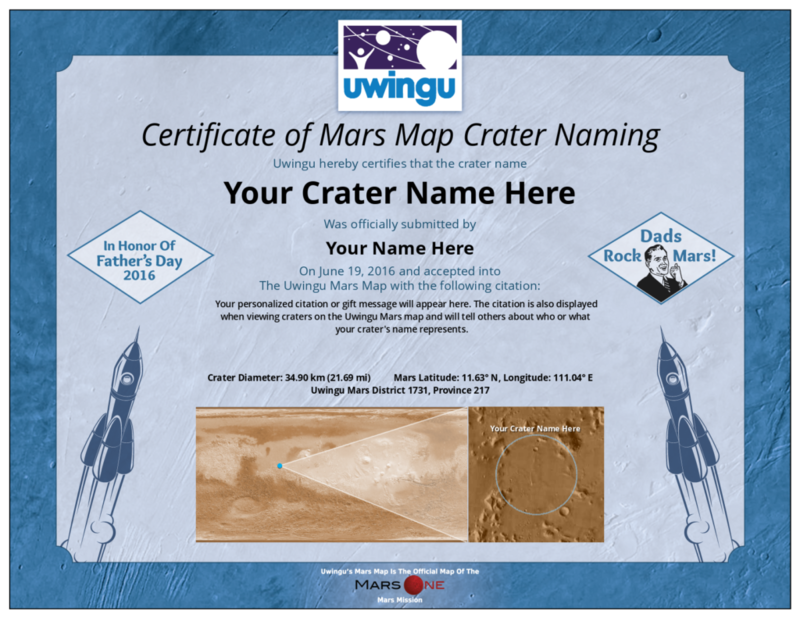 Today through June 16th, Uwingu is offering to give the first 100,000 people who sign up for our free, monthly newsletter, a completely free gift certificate to name a crater on our public engagement Mars map in honor of a dad. Uwingu’s Mars Map will be carried to Mars aboard both the first Mars One robotic lander and also on the Time Capsule to Mars Project. Every crater named for a dad before Father’s Day on June 19th comes with a commemorative Father’s Day 2016 naming certificate emailed to the buyer. Join our newsletter HERE so you get the free gift code! ← Uwingu Says—Make an Impact on Mom with an Uwingu Mother’s Day Gift!